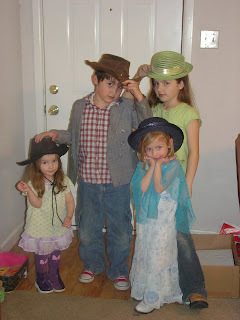 It was so sweet to come home to my kiddos all dressed up. They were having fun playing and then took some pictures. It kinda reminds me of the 'old timey' pictures that cost you a fortune at amusement parks. So smart of them to save me a bundle! I have been realizing so much that life is so fragil and how much we take for granted. I have been asking the Lord for more joy. Because the joy of the Lord is my strength! And as you can see...these kids bring me lots of joy! Thank you Lord for them!